The last time my husband and I both had a day off on the same day, we decided to have a little adventure and get out of the heat! The weather forecast predicted 101 degrees at our house, and hotter in town. We decided to head North about an hours drive to a town whose higher altitude typically stays about 10 degrees less than we live with. After grabbing a few supplies including our 2 favorite Solar Cookers ( The Hot Pot and the Global Sun Oven) we set out to make a day of it. Arriving at our destination not too much before lunch time we found a nice park with wonderful deep shady spots to relax in and plenty of sunny spots to cook in. I put 4 ears of corn in the hot pot (my favorite way to do corn in a solar cooker is to pull off the "hair" at the top and put in the ears to cook in their husk) and Tilapia that was seasoned with herbs and lime in the Sun oven. Then we kicked back in the shade to read our books while our food cooked. The Tilapia was done in about 20 min. cooking at 350. The corn took about 30 min. After eating our bounty, we decided it was so comfy in the shade, and so hot out of it, we lounged in the shade all afternoon, people watching, reading, and visiting. I had wanted to wander around the University Campus in that town where the annual Shakespearean festival was going on but after eating such a satisfying lunch and reading such an interesting book and visiting so many friendly people, we ended up staying parked at the park all day. and since I had been uncommonly lazy about getting the bulgur in the hot pot for the Chicken Salad I meant to make for dinner,We stopped at a Mexican Food Grille where I had an amazing Raspberry Chipotle Smothered Burrito that will be my new favorite in the Sun Oven as soon as I figure out that great Raspberry Chipotle sauce! Ah, the warm and lazy days of summer! 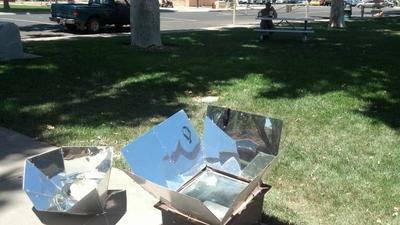 Always an opportunity to solar cook wherever and whenever is a great motto.